Schönbrunn Castle is one of Vienna's main sights and thousands of people from all over the world come here to see the magnificent building annually. In fact, Schönbrunn has retained its place as the number one within the category of the city attractions that are the most popular to visit since 1960. The palace was built in the 1700s and the architecture was made in baroque style, making the castle something very special to behold. There is also a large garden where you can take some very nice pictures or just sit down and take it easy for a while. You also shouldn’t miss seeing Glorietten, which is a large gazebo with a café and a view over the castle. You'll also find the world's oldest zoo (Schönbrunn Zoo), a maze and a number of other interesting attractions. Another incredible building that is well worth a visit is Hoffburg. Hoffburg is a former imperial palace, which was built in the 1400’s and over the years it has been a seat for the kings and emperors of the Holy Roman Empire. Today there’s no longer any king or emperor at Hoffburg, but instead it is the residence of the Austrian President. There is also a chapel, the Imperial Library, Spanish Riding School, the Treasury, the National Theatre and many interesting museums. It’s worth knowing that Hoffburg is the world's second largest residence after the Vatican City in Rome. Würstelstand, or hot dog stand, is something you come across a little here and there on the streets of Vienna. While you’re walking around the city and you get hungry for something to eat, one of these hot dog stand will be a great place to stop and quickly fill up with energy. The sausage is usually served sliced on a plate with bread and a mini fork, which is a bit different from what you might be used to. If you want to be absolutely sure to get the best "wurst", you should get to Würstelstand am Hohen Markt or Bitzinger Wurstelstand am Albertina Platz. Prater is a stork park in Vienna and it’s an excellent place to relax in after walking around in Vienna's central and more vibrant parts. The park was originally used as an imperial hunting ground, but is today a public park that is popular with tourists as well as Vienna's inhabitants. Both children and adults can enjoy and appreciate all there is to do here. Among other things, there is the opportunity to ride a bike, ride a pony or go around on the various walkways. In the park you will also find the amusement park Wurstelprater that has several attractions. A fun fact that might be worth knowing is that it was in the Prater that the World Expo 1873 was held. Inside the amusement park Wurstelprater, you have one of the world's most famous Ferris wheel; The Riesenrad. Riesenrad is the only work that remains from the British engineer Walter B. Basset, who also constructed and designed similar Ferris wheels in London, Paris and Blackpool. Additionally, this Ferris wheel has become extra edge because it has been featured in the film "The Third Man" of 1949 and the James Bond movie "The Living Daylights" from 1987. The design is robust and consists of large gondolas that are very similar to those seen in many ski systems. When one is at the top of the wheel, one is 65 meters high and have a magnificent view of Vienna and the countryside round about. Stadtpark is another nice park in Vienna, which is a bit on the outskirts of the city center. This is a great place to get away to to quickly get away from the otherwise bustling city center and relax for a while. Here you can sit down at one of the park benches or walk all around among beautiful plants and flowers, singing birds and small streams. You can also view various statues of the great Austrian composers, with golden statue of Johann Strauss in the lead. There is also the opportunity to sit down on one of the outdoor terraces to grab something to eat or drink. Whether you are an art lover or not, a visit to the Museum of Art History will be a very pleasant experience. Would you not be impressed by one of the world's largest collections of older art, the building with its beautiful architecture is very likely to be very impressive. To make the museum so just need about half a day to see all the art, but it is possible to sort out the best if you are short on time. It is on display is a piece of European art history with works from mainly European artists, but also Oriental, Egyptian, Greek and Roman antiquities in the collection. Inside the museum there is a very nice cafe where you can sit down and have something to eat or drink. At St. Peter Square in the heart of the city center you will find St. Peter's Church (Peterskirche). This is a magnificent church in the typical baroque architecture built in the 1700s. Due to lack of space when the church was built in its shape is quite compact, but with its oval interior housing an astonishing amount of space. The interior has a very detailed interior including beautiful stucco in gold. As visitors have the opportunity to go into some parts of the church completely free, but if you go around the whole church, it will cost a small fee. If you are lucky when you visit Vienna you manage to pinpoint any of the concerts that go to church. Anyone who is interested in technology and vehicles should not miss to visit the tram museum in Vienna. Tram Museum is the largest and contains a large collection of trams from different eras. Here you'll find, for example, a horse-drawn tram from 1868 and a ångspårvagn from 1885. There are also several buses of different models from the years 1949 to 1978. In total, the museum is 7500 square meters with four halls and the various cable cars displayed at about 1800 meters track. Is it a family so this is a great place to visit when most children will appreciate all there is to see and do at the museum. Vienna is a very nice city to walk around and explore on foot, but also a very beautiful city to see from the river Danube. Seeing a city from the water often gives a different picture, and it's easy to see new details of the cityscape that you otherwise wouldn’t have seen from land. During a typical boat trip on the Danube, you drive past famous places like Prater, Donauturm, Kunsthaus, Hundertwasser House and the United Nations building. There are also evening tours during which you get to experience all of Vienna's beautiful lighting at night. Would it not be content to go boating along Vienna, it is possible to take a longer trip on the Danube to Bratislava or Budapest. If it not enough to see the city from the water or from the spinning Riesenrad so you can also look out of Vienna from the lookout tower Donauturm. Donauturm is the landmark of modern Vienna and is located in the Danube Park. In total, the tower is 252 meters high and has both a restaurant and observation deck. 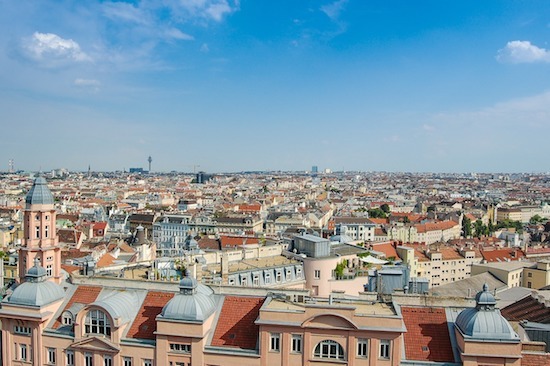 When one is at the top of the tower you can see across the whole of Vienna and vicinity. A good piece of advice is to come here on a beautiful evening to watch the sun go down behind the city. When in Vienna, you should experience a concert with music pieces from one of the great Austrian composers. An excellent place to go to listen to classical music from one of the greatest composers are Mozarthaus. Mozarthaus is a small concert hall with only 60 places where you can come and listen to live music from Mozart’s musical pieces. Mozart himself performed in this building during the time he lived in Vienna, and much of the interior from the 1700s is well preserved. The concerts are held every Saturday at 18:00 and on Thursdays, Fridays and Sundays at 19.30. A good piece of advice is to book in advance as seats often run out quickly.